Get off the beaten track on the verdant Canary Island of La Palma, a UNESCO World Biosphere Reserve. The warm year round climate and dramatic volcanic scenery makes La Palma a great winter walking destination. Caldera de Taburiente - Explore this distinctive crater-like ridge that dominates the centre of the island. Our trip starts at La Palma airport. Our hotel is 45 minutes away in Los Llanos on the west of the island. Los Llanos is one of the main towns on La Palma and has an interesting 'old town',a selection of bars and restaurants and usually good and sunny weather. The coast is nearby, with the nearest beach Tazacorte, three kilometres away. 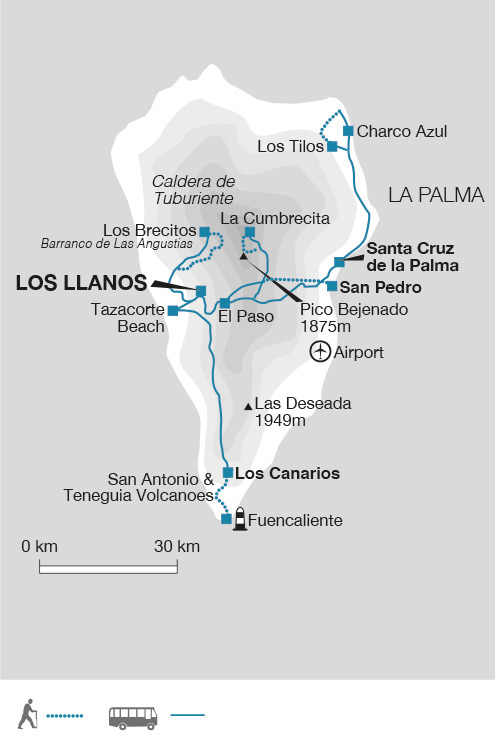 We start today by travelling south to Los Canarios to visit San Antonio Volcano Visitors Centre. Here we learn about La Palma's volcanoes and local volcanic activity. After this we walk to Teneguia Volcano, the site of the last land-based eruption on the Canary Islands in 1971 - you can still feel heat radiating to the surface. We then continue on to Fuencaliente on the south coast where if the conditions are right there is an opportunity to swim before travelling back to Los Llanos by taxis or minibus. In the evening their is the possibility to sample some lovely local dishes, such as 'papas arrugadas and mojo' (wrinkly potatoes with sauce), in the local restuarants. Today's nine kilometre walk is expected to take around four hours with 100 metres of ascent and 650 metres of descent. Today we take a short drive to Ermita del Pino chapel (900m), near El Paso, for our walk east along the ancient 'Camino Real' trail, the route by which local people travelled between the west and the east before the modern roads. Crossing the Cumbre Nueva volcanic ridge at Reventon Pass (1,419m) we then descend through lush forests to San Pedro village (355m). From here we travel by public bus to the capital Santa Cruz the island's capital and have time to explore the charming 'centro historico', one of the best preserved colonial style old town centres on the Canaries, before returning to Los Llanos by public bus. Today's nine kilometre walk is expected to take around four hours with 550 metres of ascent and 1,050 metres of descent. Our walk this morning starts in Los Brecitos in the Caldera de Taburiente, the distinctive, massive, crater- like ridge that makes up the centre of the island, surrounded by vertical walls and ridges as high as 2,550m. We will pass a huge rock which used to be the single most important site for the indigenous cultures long before the Spaniards conquered the island. From here we follow the classic trail descending down to the bottom of the Angustias Gorge (the Gorge of Fear). Today's 14 kilometre walk is expected to take around five hours with 200 metres of ascent and1,000 metres of descent. Please note this walk is dependent on local conditions and may be need to be amended at short notice. Today is a free day to relax or explore the region more. It is possible to walk to the local beach at Tazacorte, or catch local buses to the beach, the capital Santa Cruz or around the island. 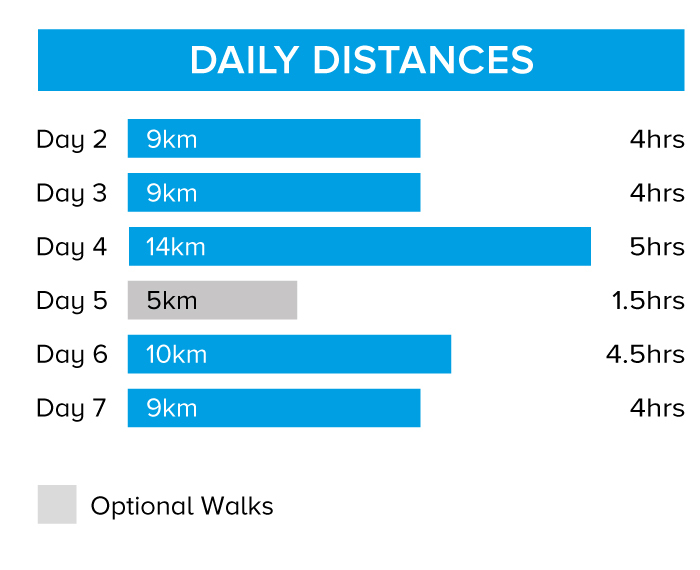 Today's optional five kilometre walk is expected to take around one-and-a-half hours. This morning we drive approximately an hour and a quarter to Los Tilos in the north-eastern part of the island. Here we walk through dense subtropical Laurisilva cloudforest, (laurel forest now mainly found in the Canary Islands, Madeira, the Azores and Cape Verde) to Barlovento village. On the way back to Los Llanos, if weather conditions allow, we may be able to stop at Charco Azul for a swim in the natural pools of the Atlantic Ocean. Today's 10 kilometre walk is expected to take around four-and-a-half hours with 500 metres of ascent and 150 metres of descent. Drive 30 minutes to Cumbrecita where today's walk starts, a view point looking over the Caldera de Taburiente. From here we ascend Bejenado Peak (1,857m) which on a clear day also has stunning views over the Caldera, Valle de Aridane and the island's volcanoes. We then follow the trail down to the road and take taxis back to Los Llanos. Today's nine kilometre walk is expected to take around four hours with 570 metres of ascent and 700 metres of descent. Our trip ends today at La Palma airport. The warm year round climate and dramatic volcanic scenery makes La Palma a great winter walking destination.